Battlestar Galactica is, easily, what turned me completely towards the geek culture. I was already working my way there, but I won’t lie, I used to be one of those people that looked at my friends when the re-imagined series first started and said, “You’re watching Battlestar GALACTICA??? ?” And I said it with that tone, you know the one, the severely condescending tone when you judge something that you perceive to be a waste of time or something that is just too geeky. Finally, my friend, Steve, sat me down and told me to watch one certain scene within the second season of the show. He told me that if watching that scene didn’t make me give Battlestar a chance then he would give up and never mention Battlestar Galactica again. The setting is in the second season when we arrive on board the Battlestar Pegasus in episode 10. It’s the scene where Gaius Baltar first sees the state of Gina Inviere (yet another copy of the Number Six Cylon), played by Tricia Helfer, in the ship’s brig. She’s chained to the floor and is mentally, physically, and spiritually broken due to the torture she has endured from the crew of the Pegasus. It is a very hard scene to watch. In any case, James Callis delivers one of the most moving and emotionally charged monologues within the series. It immediately brings tears to my eyes anytime that I hear it. Listen to it here. After I dried my eyes, I turned to my friend and asked him to start me from the beginning. From that very moment, it was over. I was hooked and Battlestar Galactica would become a permanent fixture in my life. Online handles were based around the show as I played World of Warcraft during the same time period. I had characters named Caprickah (which spawned my Twitter handle) and Thraycia. In a few online forums, I became known as Starbuck, and in others, GaetaGirl or StarbuckSpitfire. I collected everything that I could from the novels and comics, the soundtracks, as well as action figures and shirts. Upon heading to the NASA Tweetup for the launch of a satellite called Juno last year, I had thought about changing my Twitter handle. I had used Caprickah since Twitter was established. I was chosen to ask the first question to Bill Nye, the Science Guy, and his approval of my Twitter handle has now made me never want to change it. My devotion even stems to inking my skin. I have had an idea for a Battlestar themed tattoo for a long while, but I just need someone to draw it. If you cannot tell by now, Battlestar Galactica is my most favorite television show of all time. Battlestar can move me to tears, Battlestar can make me laugh, and Battlestar has some of the most devoted actors and actresses in the business that, even years after the cancellation of the original show, are filling auditoriums at conventions across the world. Since coming back to the United States after serving my final tour in the U.S. Navy in Sicily, I’ve been to three conventions and have been able to meet many of the actors and actresses that brought this show to life. I stood in front of Edward James Olmos with tears running down my cheeks and he gave me the biggest hug in the world. Michael Hogan read my shirt, which said “Don’t FRAK with the Cylons”, in his Saul Tigh growl and I growled “Gaius frakking Baltar” back at him. I was able to tell Tricia Helfer and James Callis about how I started watching Battlestar Galactica and I thanked them for their beautiful performances. I was able to hold short conversations with the likes of Michael Trucco, Katee Sackhoff, Jamie Bamber, Nicki Clyne, and Tahmoh Penikett. Needless to say, I was devastated when I found out that Battlestar was going to be canceled. Before the release of every half season, I would marathon through the episodes that I owned to re-envelop myself in the world created by Ron Moore and David Eick. All the way through to the end, and even when it seemed like I was the only person who legitimately liked the finale, I was happy with the outcome. Do I wish Starbuck was elaborated on more, especially towards the end? Of course, I do, but as with all shows, things must come to an end. I understand leaving an air of mystery to a character like Starbuck. The writer’s strike took many casualties and Battlestar definitely fell victim. There was a light at the end of the tunnel, though, at least for me. That light was named Caprica. In this prequel, we were going to get the who, what, when, where, why and how of the creation of the Cylons. While Caprica started off slow, it really picked up in the second half of the season. It was a blow to the fans that it was canceled so early and not allowed to live to its full potential. I know I was not the only person to see the potential there and I really would have loved to see the evolution from Caprica to Blood & Chrome. I just watched the first two webisodes of Blood & Chrome on the Machinima Prime YouTube Channel today. I was completely blown away. How could SyFy (or Siffy, as I pronounce it) let another brilliant look into life before The Fall just slip through their fingers? This underrated cast is spot on with the feel of Battlestar, to the point where it is similar to our introduction to the cast of the re-imagined series. There is so much room for each character to grow, not to mention, that you will know some of these actors right off the bat or their names will be right on the tip of your tongue. One thing that must be mentioned is the beautiful CGI. 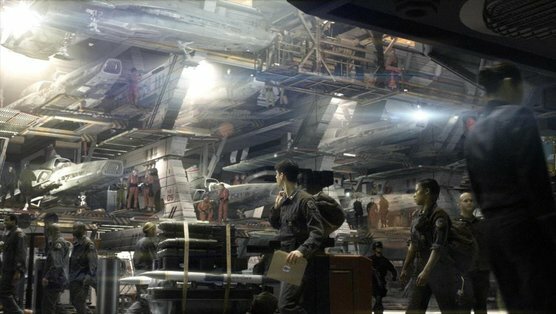 Galactica’s hangar bay, alone, is a sight to be seen. I’m sure that I’m not the only one who got shivers down their spine watching Husker get his first view of the Galactica either. A small hope that I have for Blood & Chrome is an introduction to the 20-something Saul Tigh. This show, thus far, is beautiful and it is just so incredibly shiny. Do not miss out on it. As always, my hopes are high for a new addition to the lineup of my favorite universe. Blood & Chrome already has an edge that Caprica did not; where Caprica started off slow, Blood & Chrome is already rolling with the action. I cannot wait to see what the coming weeks bring. And don’t forget, Amazon already has Blood & Chrome up for pre-order.